Falls Church, Virginia, September 7, 2017 — Pivotal Point, LLC (Pivotal Point) is pleased to announce recognition by Washington Technology on its Fast 50, which highlights the fifty fastest growing small companies on the government contract market. 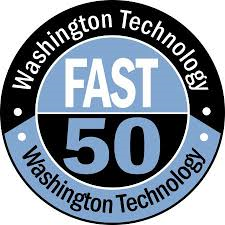 The Washington Technology Fast 50 List is published by Washington Technology. Washington Technology is the authoritative source of competitive intelligence for executives providing contract services to the government market.They rank the fastest growing small-business contractors in the government market. The rankings are calculated based on their compound annual growth rate from 2012 through 2016 for the final published 2017 list. Pivotal Point is a CVE Certified Veteran-Owned Small Business (VOSB), Certified 8(a) by the Small Business Administration (SBA), and Economically Disadvantaged Woman Owned Small Business. Founded in 2008, Pivotal Point provides customers with quality assured, ISO certified program management and business consulting, Information Technology (IT) and telecommunications.